Gosh darn it life has caught up with me all of the sudden. I don’t even have the energy to respond to email, let alone write blog posts. 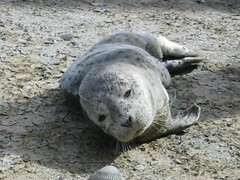 So here is a baby seal to entertain you. Oh, I also got a camera phone – so maybe there’ll be something entertaining in my flickr feed (click photos above to view). Then again, considering how much all I want to do is nap? I’d say the odds of me taking interesting cameraphone pictures of something other than my head under a pillow are probably nil.